Ali Cardabra was about seven years old when he started his lifelong interest in magic and puppetry. As well as performing, he has manufactured feather flowers, polished aluminium Chop cups, zombie balls, dove pans, multiplying bottles etc for many magicians and dealers including Ken Brooke, International Magic, Repro Magic and Kovari. In the early 70’s Ali Cardabra made many TV appearances as a walk on artist. He appeared in Wodehouse Playhouse and Thomas and Sarah with John Alderton and Pauline Collins, I Claudius with Derek Jacobi, The fall and rise of Reginald Perrin with Leonard Rossiter, London Belongs to Me. Thames TV’s Shakespeare series and BBC’s Shakespeare series as well as countless other comedy shows and police drama’s. Ali Cardabra’s first magic lecture was for Ron Macmillan’s International day of Magic at the Empire Rooms, Tottenham Court Road, London 1986. He has continued to produce routines and effects for magic magazines including, Info, Magigram, Repro’71 and Abra up to the present day. He has lectured on magic all over the UK and across the globe. He has lectured and performed on six Repro magic cruises aboard the QE2, The Millennium and the Queen Mary 2 . 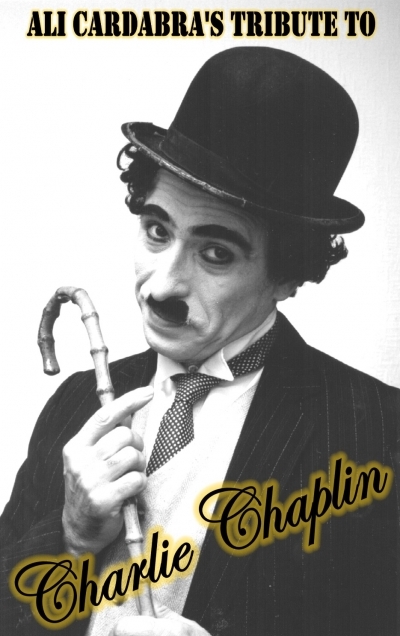 Ali Cardabra Specialises in performing in character, his most popular being a tribute to Charlie Chaplin which he has performed world wide! He has performed before members of Chaplin’s own family with favourable reviews at a festival of silent film in Holland with a live orchestra conducted by Clive Davis.